Here we are again. That time of the month where I bring you an interview of an awesome self-published/Indie author. Why? Because we have to spread the word of these awesome authors so that their fandom can grow. And so we can support the ones who put a lot of work into their babies so that we can all bring them into our world and basically tear them apart. If you remember last month, I gave you an interview with Jonas Lee (read HERE). Then this amazing thing happened and this lovely author thanked me for writing a review on her novel Rain of Ash. That is when the idea struck. I could interview indie authors and spread the word about their wonderful work. I could make this a monthly thing on my blog! At least until I have more authors. Then maybe it will be twice a month. Anyways, on to the interview. I warn you, the questions are pretty much the same as Jonas Lee’s questions, but I am working on changing these up for future interviews (which I already have two lined up!). 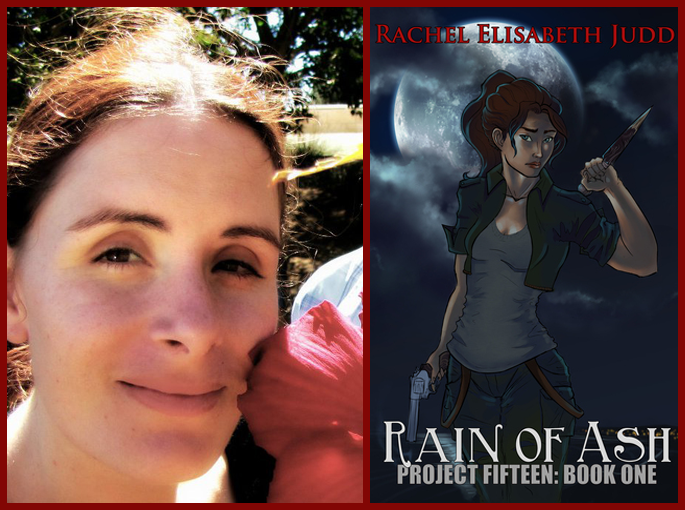 What inspired your novel “Rain of Ash”? Ever since I was a young teenager, I’ve always enjoyed vampire stories – and my favorite part of those stories were usually the hunters Van Helsing is my favorite character in Dracula (though, confession: I’ve never watched Buffy). I’ve also really enjoyed the rise of urban fantasy as a genre, I love the juxtaposition of traditional myth and folklore with modern settings. And one theme which runs through a lot of my work is exploring the different relationships between women. So when I sat down to write Rain of Ash, the broad strokes were already there – a vampire hunter novel, about a main character who’s biggest challenge was navigating the relationships with the various women in her life. How many books should we be looking for in the series? And when should we expect the next book to be released? I don’t want the Project Fifteen series to go on forever – I have a specific end in mind, and I know roughly how the characters will get there. I’m not sure if this will end up being a trilogy, I suspect the entire series will end up being 4 or 5 books (depending on which twists the characters end up taking to get there!). As far as when to release the sequel – I’m hoping the spring of 2016! I’m already 30,000 words into the next book, and assuming I don’t throw out half the plotline and start over (which has happened once already), I think I’m on track for a spring release. How long did it take you to write Rain of Ash? Quite a while, actually. I started the first draft years ago as a just-for-fun thing. I would pick up the story, work on it a bit, then put it down for months at a time. But once I pulled together a writing group (and therefore had a deadline for each installment), I finished the book in about ten months. After you finished writing the novel, how long did it take to polish and publish it? Probably about three or four months. I did a ton of revising through both computer and on paper… and about halfway through, realized there was a pretty big plot hole near the end I needed to patch, so that also took a little more time. A lot of authors say that some of their characters take on characteristics of them. What character is more like you? I don’t really enjoy fiction with obvious authorial self-inserts, so I try and stay aware of when I might be doing that for my own characters. Gwen’s history of having a religious upbringing and then later moving away from that mirrors my own; though she’s definitely more of an action-oriented person than I am. For awhile, I thought I’d become a librarian, and I put that part of me into Aaron. I like good craft beer the same as Roy, too. And I chose to set the story in Santa Barbara because that’s a town with a lot of good memories for me! Yes, most definitely! I’ve been attracted to the post-apocalyptic genre, but I’d like to see how things change if the apocalypse had a magical origin instead of scientific one. I also have recently developed a love of Westerns, and that’s a genre I’d also like to explore. What obstacles have you faced in your own writing journey? Self-discipline – it can be hard to work on the same project day after day, especially when I get stuck. I’ve finally decided it’s okay to have multiple projects going at once, which helps keep me doing something, even if it’s not my core project. What do you dislike most about being an Indie author? Or, what is the hardest part of it? I’m really bad at self-promotion, and I never quite know how to talk about myself and my work. The south end of my (very large) dining room table is my creative corner. But as long as I have my computer, I can write anywhere. What was it like when your novel was edited for the first time by someone other than yourself? Was it painful to see suggestions to change certain aspects of your novel? To a certain extent, I steeled myself for criticism when I sent drafts out to my beta readers, and told myself that no matter what they said or how hard it was to hear, anything they said was because they wanted to help me. Perhaps it was that attitude which made the beta reader feedback easy to take. But fortunately, no one said that any of my core ideas weren’t working; I might have reacted quite differently if a beta reader said they didn’t like how Gwen’s relationship with Lydia drives her forward! Do you plan on becoming a traditionally published author, or do you want to stay as an indie author? Indie indie indie indie. I am so excited by the indie revolution in books, music, games and film; and I want to be a part of that. What inspired you to start writing? At what point in your life did you decide you wanted to be a writer? When I was a very small child, my mother bought me and my sister these really elaborate journals, bound in white leather with our initials on the spine in gold. We were too young to really write coherently, but we dictated our thoughts and feelings, and my mother dutifully wrote them down. And even though writing my name in crayon was a challenge at the time, I nevertheless told my mother that I wanted to be an author when I grew up. What author inspires you the most in your own writing? Lilith Saintcrow. She writes the same sort of female-driven urban fantasy adventure stories that I do, and I love her characters, her worldbuilding and her way of stringing words together. I also enjoy Jim Butcher’s mastery of dramatic pacing. Gwen’s fake name Jill Murphy is an homage to characters I’ve enjoyed in both Saintcrow’s and Butcher’s work. If you could collaborate with any other writer, who would it be? What kind of story do you think would come of it? Definitely the two authors I’ve mentioned above. How has your family been when it comes to writing? Where they supportive? Did anyone doubt you could be an author? Did you have anyone that tried to bring you down? My mother has been my biggest fan, she’s a wonderful person! My dad did read my book, but I think he would have liked it better if I’d written a Clancy-esque political thriller, which is what he normally reads. I’m not sure if my brother or sister have read it, and I’m pretty sure my extended family hasn’t (they’re mostly very religious people, I’m not (at least not their religion), so we don’t speak much). What do you hope others take away from your stories? Mostly, I just hope people are entertained enough to come back for more! Do you have any other hobbies other than writing? Yes! Quite a few! I’m heavily involved in my local LARP (live-action roleplay) community; I love the hobby and I love all the amazing, creative and passionate people I’ve met through it (and continue to meet!). As a result of my involvement in larp, I’ve taught myself how to sew and am right now learning beadwork. I also enjoy brewing beer and have an extensive collection of video games. Where do you hope your career will be in 10 years? My hope is to expand into the transmedia sphere, and to be able to work on books, games and other ways to tell stories. Do you have a dream office? Anywhere quiet and sunny with a fast Internet connection works for me! Is writing now your full time job? I have a couple other projects in other media, but yes, all of them together are a full-time job. Who is your favorite author to read? Such a difficult question! It really depends on my mood, and why I’m reading. Honestly, I like finding other indie authors and reading what they have out. I’ve found a diverse plethora of stories and styles I wouldn’t have found otherwise! They say that writers read (or should read) as much as they write. Do you find this true in your personal life? I actually don’t think it’s quite necessary to read, per se, but you should always be consuming new stories. Reading, of course, helps you pick up on the genre conventions and absorb the best way to word a phrase. But pay attention to the stories on TV, on film, in games and graphic novels and anywhere else you can find narrative. Pay attention to how a TV show tells it’s story, and compare it to the way a novel does. Because the story is the most important part – once you get that down, you can do anything! Do you have any advice for other writers? Any tips or tricks that you may have learned along the way? A lot of writers say ‘keep writing’, and that’s true. You have to write at least a little bit every day; that’s the only way to make progress. But I’ve also found that I can’t rely on other people’s expectations or feedback. Know that you are a good writer, work to make your writing the absolute best that it can be, and be sure that there are people out there just dying to read what you’ve wrote. That’s the sort of perseverance which will see you through! Thank you so much Rachel for letting me pick your mind. I can’t wait to see more from you! You can read my book review at The Reading Bud HERE. You can read more about Rachel at Goodreads. Great interview. I really like Rachel’s thoughts on the writing life. Love that you’re doing this for the indie community!